Dublin has been ranked 21st out of 30 in a list of the greenest cities in Europe. According to the Siemens European Green Cities Index, which was compiled by the Economist Intelligence Unit, Dublin is the worst city in Europe in terms of its transport infrastructure. It also scores badly across a number of other key categories including buildings, environmental governance, CO2 emissions, energy, water consumption and waste and land use. The only category in which Dublin performed well was in terms of air quality, where it was ranked in fourth place. The index measures and rates the environmental performance of European cities across 30 individual indicators, including water consumption, waste management and greenhouse gas emissions. Sixteen of the index’s 30 indicators are derived from quantitative data and aim to measure how a city is currently performing. The remaining 14 indicators are qualitative assessments of individual cities commitment to consuming more renewable energy. The study found that Dublin produces 9.72 tonnes of CO2 emissions per head, nearly twice the European average of 5.2 tonnes. 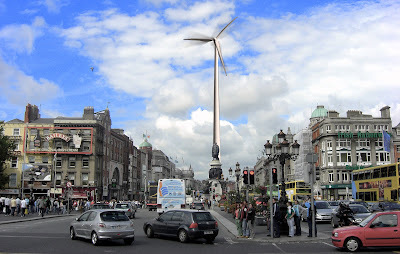 Dubliners also consumed 156 gigajoules of energy per year compared to an average of 81 gigajoules. In addition, the energy consumption of our residential buildings is 1281 megajoules, far higher than the 30 city average of 909 megajoules and Dublin residents each consume about 128 cubic metres of water each year as against an average of 105 cubic metres. The study also shows that just one in five people use public transport, compared to 42 per cent across Europe. Both the length of the capital's public transport network and its cycle lanes are well below the 30-city average and the lack of a fully-integrated ticketing system for public transport is also remarked upon. The report states that Dublin stands to benefit from nationally driven environmental proposals but it adds that progress is likely to be affected by the recession which may lead to some initiaitves being dropped or watered down. Copenhagen, of course, was ranked the greenest city in Europe followed by Stockholm and Oslo. Kiev came bottom in the rankings. Siemens chief executive Dr Werner Kruckow said it was clear that the battle for the environment would be won and lost in the cities. "The report results for Dublin city are stark, particularly in transport, however, the technologies are available today which can help dramatically improve our environmental performance," he said.